Take Your Home From Drab To Fab With Cool Factory! 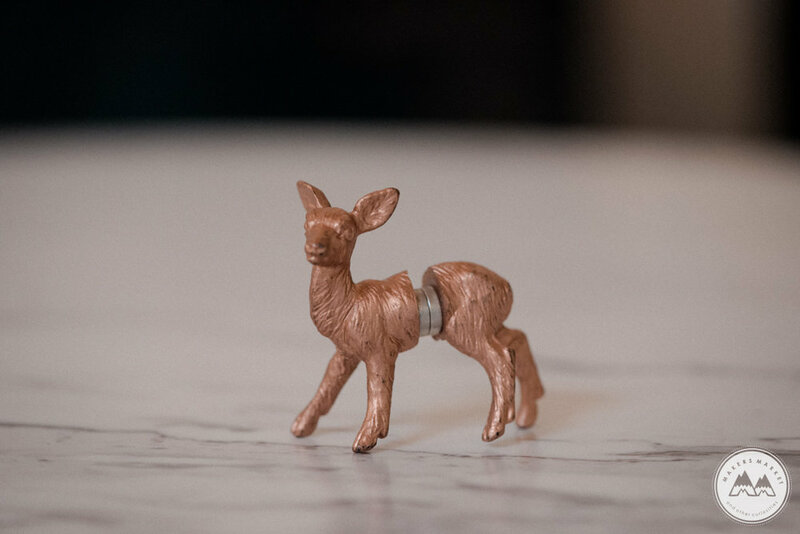 Genevieve Ongaro, of creative brand Cool Factory, has this to say of her project: "I make metallic animal magnets; they are plastic toy animals that I cut in half, spray paint, and glue on magnets. They are quirky and fun, come in gold, silver, and copper, and small and large sizes. I love that the metallic spray paint accentuates the detail of the toys, and allows them to transcend their original purpose; they instantly become classy yet still fun and versatile!" Genevieve first started making in 2014 and first joined us at Bison in 2015. Cool Factory will be selling her goods with us again for the December weekend of our fair and we couldn't be more excited!! You can follow along Genevieve's progress with Cool Factory on instagram (@genevieveongaro) and read on down below to see what inspires her to create! CF: For me, this means being able to experiment and collaborate, while also having various outlets to showcase and share my work! Edmonton is a very quirky and accepting community which makes it easy to put yourself out there and fearlessly try new things. CF: Nature and the outdoors are huge for me, as are all things cute and tiny. I love tiny things. Current human influences would be graphic designer/letterer Corina Nika (of the Cocorrina blog) and teeny tiny ceramicist Danielle Pedersen. CF: Probably my Sylvia Soo card holder…it’s my fave and I carry it around with me every day. Cool Factory will be joining us for the December weekend of our fair and you can check out the full collection of Genevieve's work by heading on over to www.genevieveongaro.com.